CARACAS (Reuters) - Venezuelan security forces arrested opposition leader Leopoldo Lopez on Tuesday on charges of fomenting unrest that has killed at least four people, bringing tens of thousands of angry supporters onto the streets of Caracas. Crowds of white-clad protesters stood in the way of the vehicle carrying the 42-year-old Harvard-educated economist after he made a defiant speech, said an emotional farewell to his family, and gave himself up to soldiers. The vehicle eventually reached a military base. Opposition leaders hope Lopez's arrest will galvanize street demonstrations against President Nicolas Maduro, though there is no immediate sign the protests will topple the socialist leader. "I am handing myself over to an unfair justice system," the protest leader told supporters, standing on a platform next to a statue of Cuban poet and independence hero Jose Marti. "May my imprisonment serve to wake the people up." The crowd lifted his wife up to give him a final embrace and hang a crucifix around his neck. Minutes later, he surrendered to military officers, pumping his fist and then stepping into the military vehicle with a Venezuelan flag in one hand and a white flower in the other. Supporters impeded the vehicle's progress for several kilometers (miles) and later gathered at the gates of the La Carlota air-base where he was taken. They disbursed in the late afternoon as a tropical downpour broke out. In a speech to a rival rally of his own supporters, Maduro said he had sent the Vice President of the Socialist Party, Congress Chief Diosdado Cabello, to help transport Lopez. Lopez's Popular Will party said he had been taken to court where authorities would formally read him the charges, which include murder and terrorism. Lopez says he is being made a scapegoat by a dictatorial government. 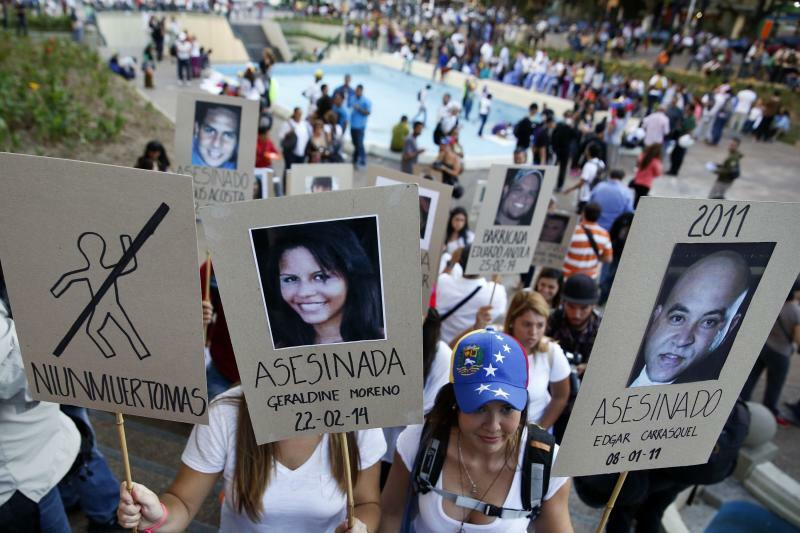 Earlier, in the coastal town of Carupano in eastern Venezuela, residents said a 17-year-old student died after being struck by a car during an anti-government demonstration. 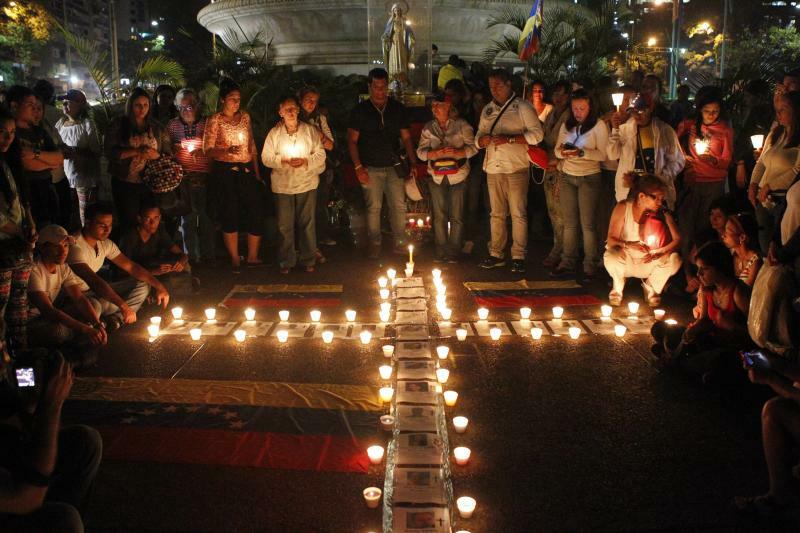 That added to three fatal shootings in Caracas last Wednesday. Student-led protests across the nation of 29 million people have become the biggest challenge to Maduro since his election last year following socialist leader Hugo Chavez's death. They demand Maduro's resignation over issues ranging from inflation and violent crime to corruption and product shortages. "The country's situation is unsustainable," said filmmaker Jose Sahagun, 47. "The government's mask has fallen off. This man (Maduro) has held power for 10 months and the deterioration has been fast." The protesters appear unlikely to have the influence of Arab Spring demonstrations that toppled governments across the Middle East, in part because Venezuelans unsuccessfully tried similar strategies against Chavez a decade ago. There has been no evidence Venezuela's military might turn against Maduro, the 51-year-old successor to Chavez. Thousands of oil workers and Maduro supporters, clad in the red of the ruling Socialist Party, held their own demonstration in Caracas on Tuesday, music blaring in a party atmosphere. The unrest has not affected the country's oil industry, which is struggling from underinvestment and operational problems that have left output stagnant for nearly a decade. Chavez purged state oil company PDVSA of its dissident leadership in 2003 after a two-month industry shutdown meant to force him to resign, making it unlikely workers could attempt something similar against Maduro. In a nation split largely down the middle on political lines, 'Chavistas' have stayed loyal to Maduro despite unflattering comparisons with his famously charismatic predecessor. Many Venezuelans fear the loss of popular, oil-funded welfare programs should the socialist lose power. "Chavez lives, the fight goes on!" Maduro backers chanted. An opposition legislator and anti-government activists alleged that a government supporter had hit the dead student in Carupano, Jose Ernesto Mendez, but there was no independent confirmation or response from authorities to the allegation. 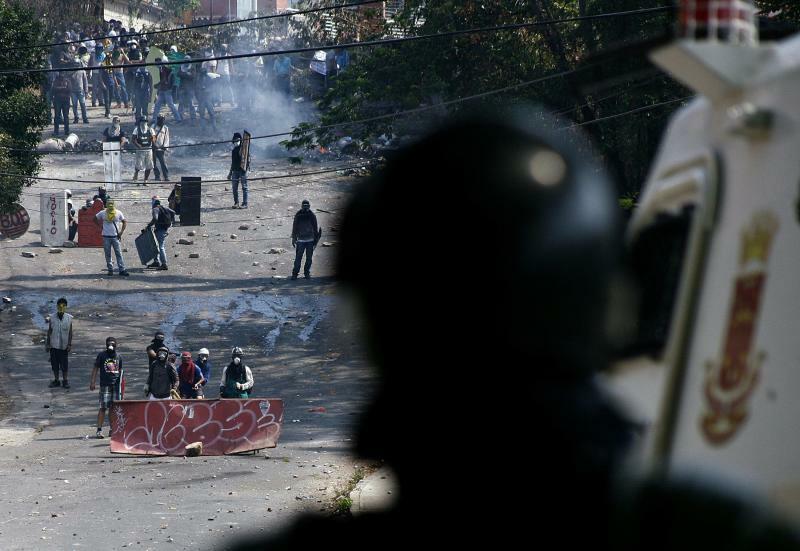 Residents said three other demonstrators were injured in the melee in Carupano, in Sucre state. One was gravely hurt. A government statement said a man had been arrested for running over a 17-year-old and injuring three others. Maduro's government accuses opponents backed by Washington of seeking to promote a coup against him, similar to a botched attempt against Chavez in 2002 when he was ousted for 36 hours. The burly former bus driver and union activist this week expelled three U.S. diplomats accused of recruiting students for the protests. Washington said that was "baseless and false." Venezuelan global bonds, which fluctuate sharply on political unrest, dropped as much as 3.2 percent on Tuesday. Yields on the benchmark bond maturing in 2027 rose to nearly 16 percent. Yields are on average 15 percentage points higher than comparable U.S. Treasury bills, by far the highest borrowing cost of any emerging market nation. Complaints about acts of violence by both sides have piled up over six consecutive days of confrontations between police and demonstrators. Only 13 students were reported still being held after nearly 100 arrests in the past week. Opposition activists say some of those detained have been tortured. Maduro says police have been restrained in the face of provocation and attacks.